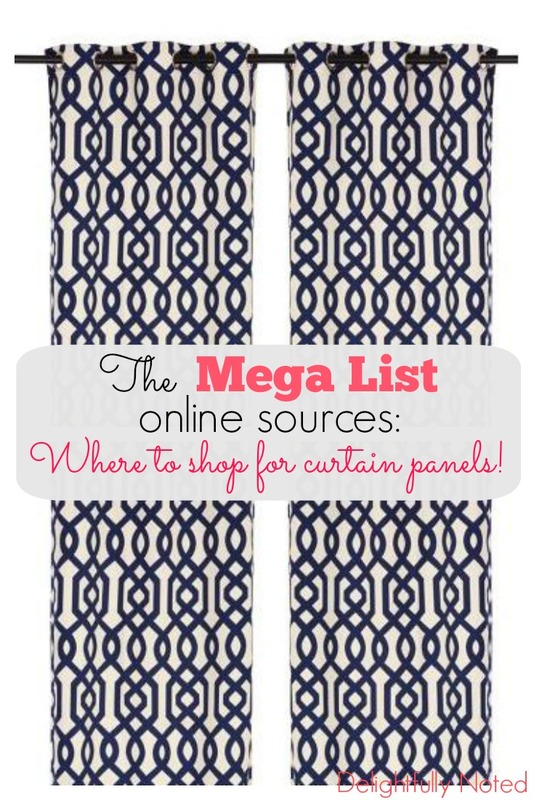 The Mega List: Where to Shop for Curtain Panels! We interrupt your regular broadcast to bring you a rant about curtain shopping. Retailers, listen up. Windows are like people, we all come in different shapes and sizes. So what's up with all this 84 inch shenanigans? I may be vertically challenged but my windows are not! I've been consumed (and by consumed I mean borderline obsessed) with finding curtains for our new house and I quickly realized if I didn't want my windows to look like Steve Urkel and his "flood" pants then shopping the box stores was not the way to go. So onto the world wide web it was AND let me tell you NO stone was left unturned when it came to me browsing online for curtains. I searched and "Googled" the heck out of curtain panels, like it was my job. The wonderful thing is that most retailers online sell a wider range of sizes and lengths and I also discovered a few places I would have never thought of checking out! I figured I couldn't be the only person with this problem, so today you get to reap the benefits of my painstakingly thorough journey through virtual curtain shopping land. You're welcome. This post contains affiliate links. Please see our full disclosure policy to learn more. Editor's Note: This post has been updated in 2018 to the best of my ability, though some content may link to items that are no longer available. I tried to rank these from least expensive to YOU NEED to consider selling your organs on the black market to afford these. Walmart-Wally World actually has some good looking (and not to mention VERY affordable) options! Kohls-I'm currently debating between these and these for our living room. Stay tuned. Home Depot- Concrete and curtains? I'm sure the HD isn't exactly the first place you have in mind when shopping for home decor BUT don't forget them and good ol' Martha are besties. If you're looking for bold and graphic styles then look else where, but basic solids--they've got you covered! Lowe's-While we're on the subject of home improvement stores, I have to say Lowe's impressed me with their selection of drapery (Watch out Home Depot)! You will specifically want to check out their Allen + Roth line. Target- Tarjay never disappoints. I'm particularly fond of their Threshold line. Ikea-What's not to love about the Swedes? You can check out their curtain selection here. Kirkland's-I shed a tear every time I think about how our local Kirkland's closed. I'm head over heels in love with these navy ones (same as pictured above). They're out of stock online but if you're lucky your local store may carry them. Sears- I don't think I've stepped foot in Sears since like 1991 (I'm sure they'd love to know that!) but I was surprised to find quite a few lovely curtain options on their site. Case in point.. these fabulous trellis flocked panels. Urban Outfitters-If you're going for more of a bohemian type of vibe then they've got you covered. Shaving your arm pits is optional. Wayfair-Their slogan is a "zillion things home"and BOY do they mean it! Over 1800 different styles of curtains to shop from. Joss & Main- Can someone just buy me everything off of this website? World Market-What would the world be like with out 'em? Always nice, unique finds there. Bed, Bath, & Beyond- Curtains here are a great thing to use all those 20% off coupons on! JCPenney- I'm willing to bet every family tree has drapery from Penney's. They're a great resource for custom curtains for those funky, odd shaped windows. West Elm-If my life depended on looting a store this would be the one! Forget food and water. They run sales often and have a great selection of curtains to choose from. Etsy-Support handmade! Custom and already made to buy curtains right at your finger tips. Amazon- Books, toys, curtains, and probably human organs. This place is going to rule the world one of these days. These taupe Ikat curtains caught my eye. Home Decorators- Prices range but they have a variety of styles to help you trim your windows. Crate and Barrel- Love, love, love their striped curtains! Land of Nod- Outside of kid's rooms you may find a design suitable for your other rooms too. Pottery Barn- Similar to it's offspring site, there's a large variety of classic-American styles to choose from. I'm a sucker for their patterned designs. Overstock-Gah! So many favorites at this site. See for yourself here. Birch Lane- This store just recently came on my radar. Nice, traditional styles to shop here. Ballard Designs- I'm like a thirteen-old-gum-chewing-jumping-out-of-control- Justin Beiber fan every time their catalog arrives in my mail box. Look at all these beauties. Restoration Hardware- I'm so fancy, you already know.... this store just SCREAMS luxury. Layla Grace-Your first born may need to skip college (Hello, $2,000 a set!) but you'll have the fanciest darn windows on the block. Of course, there's always Home Goods, T.J. Maxx, Tuesday Morning and other stores too--ya know if online shopping ain't your thing (what's wrong with you)? So there you have it....my mega list of places to shop for curtains! Did I miss someone? Where do you do your drapery shopping at? What's the most you've ever spent on curtains? Was it $2,000 a set?!! Wow! You're not kidding! You really did your research...I can't wait to see which curtains you chose! Wow $2,000 for a set of curtains?! That's insane and they better come laced in gold with someone to install them and make me dinner. Great post! Wow! You're right...you left no stone unturned. What a great resource for us! Thanks for sharing at my Creative Ways Link Party! Hope to see you again this week! Great post! I've found the best deals at Home Goods, but they only seem to have the shortest lengths. I've also had good luck with Target.